Sybil and Liam face an uphill battle if their love for each other is going to survive and progress to a happy marriage. Both have to overcome their own prejudices about the other's heritage. They also have to contend with Liam's mother who has no liking for the English. The teasing and witty banter between Sybil and Liam was cute and funny. They disliked each other on sight but they also found themselves attracted to each other and their way of dealing with that was to spar with words. But instead of creating a distance between them, the more they teased each other the more they liked and respected the other. I liked that the romance between the two wasn't dragged out before Liam proposed to Sybil. Even though they'd only known each other a short time I liked that the story moved on to a second phase. Sybil gets to spend time at his estate and meet his family before coming to a decision about their future. A lot happens at the castle because her presence isn't met with enthusiasm. Liam also leaves her there with his nasty mother while he goes off to attend estate business. This part of the novel reminds me of the gothic romances of Victoria Holt. Sybil is not treated very well and she has to think on her feet and deal with it quietly. Liam is not much help to her. I enjoyed all the drama at the end of the story. Liam has some pleading to do to convince Sybil to marry him. Her family are involved at this stage and her brother's response to Liam was both appropriate and a bit of entertainment before the inevitable happily ever after. 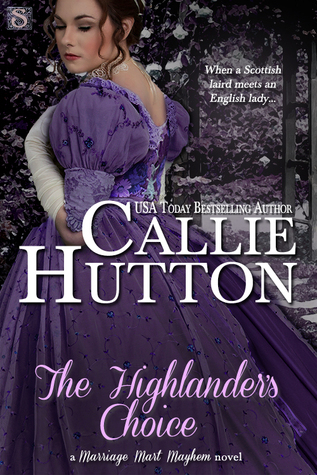 The Highlander's Choice is part of a series but can be equally enjoyed as a stand alone novel.